China's Defence ministry has refuted reports that its military was increasing combat readiness in the wake of an increasingly tense situation that has developed between China and the Philippines over a disputed territory some 200 km off the coast of the South-East Asian country. The dispute concerns the waters surround a small group of rocks known as the Scarborough Shoal and which provides rich pickings for fishermen. It is also believed that oil and gas reserves may be in abundance in the area. The wrangle, over who the island and its surrounding waters belong to, has persisted for some time. But over recent weeks the rhetoric has increased significantly. China has accused the Philippines of escalating the already tense territorial dispute following a noisy but peaceful anti-Beijing protest in Manila on Friday yet China's media has only fueled anger amongst Filipinos [BBC]. On Thursday this week China warned its citizens in the Philippines to "stay indoors" as its state media warned of war over the month-long dispute in the South China Sea. With hostility growing some advice was sensible. Beijing issued a travel advisory warning its citizens to keep a low profile given potential feelings of animosity that might be shown towards Chinese citizens. "Avoid going out at all if possible, and if not, to avoid going out alone," the advisory said. "If you come across any demonstrations, leave the area, do not stay to watch." Meanwhile there were reports coming via Japan which claimed that five Chinese warships, including two guided missile destroyers, two frigates and an amphibious landing ship, had passed through waters close to Okinawa moving towards the Philippine reefs. 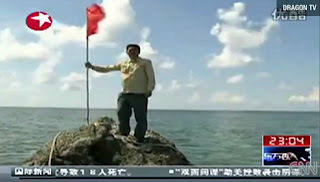 But the first sign of any Chinese presence near the rock outcrop was not a warship, but a lone reporter Zhang Fan of Shanghai's Dragon TV symbolically raising the Chinese flag on the deserted rock. Hong Lei the Ministry of Foreign Affairs spokesman has insisted the recent escalation is entirely down to the Philippine government. "The current situation concerning the Huangyan island is unilaterally caused by the Philippines," Hong said at a recent press briefing, "Over the recent days the Philippine side escalated the situation." But the Chinese media has not helped calm the situation with signs of growing nationalism and talk of war. The Communist mouthpiece the Global Times suggested that "Peace will be a miracle if provocation lasts". "Chinese authorities should make a stand and show their principles to the public, not torment their tolerance," the paper said. Meanwhile presenters on some television programmes were making remarks that boosted the nationalistic claims even further. 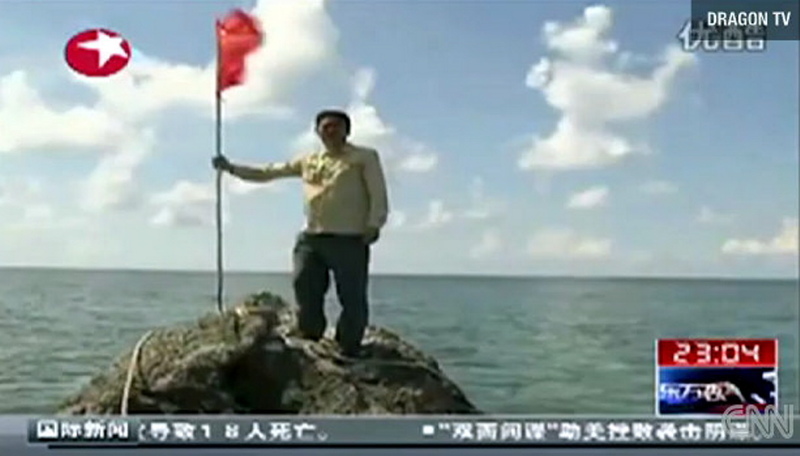 "We all know that the Philippines has always been a part of Chinese territory," a TV anchor on China's state run CCTV 13 said [YouTube - Chinese], "The Philippines is under Chinese sovereignty. This is an indisputable fact". She later claimed that the inference that the whole of the Philippines were part of China was a "slip of the tongue", but such language will do nothing to calm the mood in the region. Taiwan's NMA news channel made light of the story with one of its well known animated reports [YouTube]. However, the situation could not be more serious, not only for the Philippines around which this current dispute hinges, but also for the many other nations in the region with which China has territorial disputes, including Taiwan, Japan, Vietnam, Malaysia and Indonesia [YouTube - Economist].